In a dark and gothic future, humanity fights a constant battle for survival in a hostile universe. Now hell has come to Hydra Cordatus, for a massive force of terrifying Iron Warriors, brutal assault troops of Chaos, have invaded the planet and lain siege to its mighty Imperial citadel. But what prize could possibly be worth so much savage bloodshed and destruction? One of the most (for the time) distinctive aspects of this novel was that Chaos won, which I think was a first for a Black Library publication. After the novel was written, but before it hit the shops, I was stopped several times in the corridors of Games Workshop by people who’d recently read Storm of Iron. They told me that they enjoyed it (which was nice), but that…that…Chaos won…how could that be? 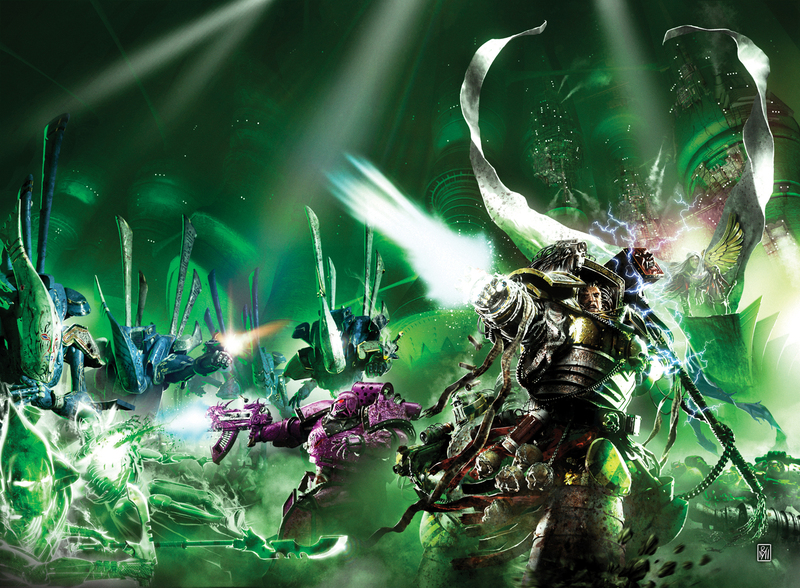 The Imperium always won at the end of a novel…didn’t they? Well, no, not always. One thing that has always appealed to me about the Warhammer backgrounds – both 40K and Fantasy – is that they’re such unrelentingly grim places. Bad things happen to good people and virtue does not always triumph. Perhaps that’s the inevitable result of a background that has its origins in this rain-soaked isle or perhaps it says something about the original writers. Or maybe it’s just me. Whatever the case, I’m eternally thankful for that quality that gives the Warhammer background such unique character. Both sides of the story got their time in the sun so that the readers would grow to like the stalwart defenders and the nefarious attackers. Normally, whichever side of the conflict gets the most attention is the side that comes out on top, but I didn’t want the reader to feel that one side was underdeveloped and thus guess who was going to win. Hence both sides have their share of triumphs and setbacks; Hawke’s launching of the orbital torpedo, Vauban’s death at the hands of Honsou etc. When the end came, it came quickly (as was the case with most fortresses taken by storm). Lots of artillery, months of siegework and backbreaking labour followed by one desperate, bloody escalade that, very quickly, turns into a massacre. It wasn’t a feel-good ending, that’s for sure. Most of the characters were dead and even the ones who survived were either hauled off into captivity and, no doubt, sticky ends, left for dead on an abandoned world or possessed by daemonic armour! And that was it as far as I was concerned, the book was over and I was done with these characters. Except it turned out they weren’t done with me, and as many of you will know, a certain Warsmith Honsou popped up again in a later novel, Dead Sky, Black Sun (and even now, he still won’t quit and has appeared in many other stories (most recently The Chapter’s Due). Storm of Iron has proved to be an enduring novel, and I’ve lost count of the number of readers who’ve brought battered, dog-eared copies to the many Games Days or signings I’ve done since the book was published. It’s the book that just won’t go away. Many a Games Workshop fan has told me that they began collecting Iron Warriors after reading Storm of Iron and plenty of the Games Workshop retail guys have mentioned that many of the Chaos players that frequent their stores have Iron Warriors armies thanks to Storm of Iron. All of which is the most sincere form of compliment imaginable.